At the start of each new year, gyms are filled with those who had too much "holiday cheer". While the training starts off with the best intentions and strong resolutions, most people will finish the year at the same or worst spot than they started. The sad reality is that most people who go to the gym fail to achieve their training goals. I want you to be the exception to the norm, but to do so, you have to consistently practice different habits than everyone else. Here are 10 habits for training success. 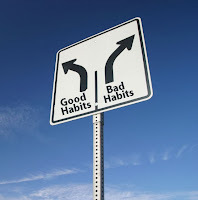 If you are willing to break some of your old bad habits and make these habits part of your training, you will be on your way to reaching your goals! Note: as you go through this list, do not just brush over some of these habits with an "I've heard that before" attitude. Use this as a check-list. 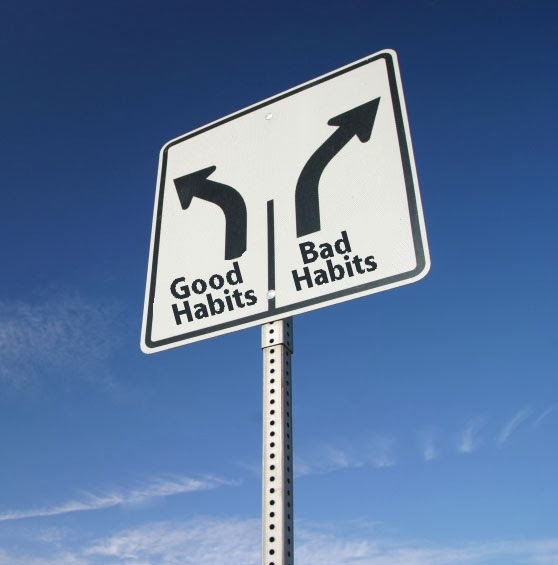 Then, look to apply the habits you are not already consistently practicing. If you find that you are not doing most of these, do not be afraid to take baby steps and work on one at a time. Most people have training goals that involve gaining a little size in some spots (e.g. arms), losing size in other spots (e.g. waist), running faster, jumping higher etc. However, unless you are a professional fitness model or athlete, these goals do not really matter all that much. Will your life be significantly altered if you go through it with a 33 inch waist instead of a 32? Now I'm not knocking these goals, but if you want to be successful in training, you had better connect your training to the big picture. To do so, start by making a list of your priorities in life. I would also suggest thinking about your passions and your purpose in life. Then, ask yourself, "how does training help me with this?" Nothing motivates you and drives you like your priorities and passions. Once you have made the connection, you will be able to stick with things for the long haul. What do I want to change in my body? How will I measure this change? Q: How much change should I expect to see in a given time period? A: increased strength on main lifts by 10% and reduce waist size by 1 inch in 6 weeks. 3. Don’t workout – train! While these terms can be used interchangeably, I use them to describe two very different styles of exercise. Workouts are for people who just like to come to the gym and get tired and sweaty while being entertained by the latest fitness fad, toy or gimmick. Training is exercise designed with one thing in mind - achieving the goal. Never be that guy who shows up at the gym and says to his buddy, "so, what do you want to do today?" Always come the gym with specific plan. It will save you from wasting countless unproductive hours wandering aimlessly around the gym. Also, when designing your training program, be sure you have a reason for everything you are doing. Do not just randomly throw things together. Let your goal dictate your program. 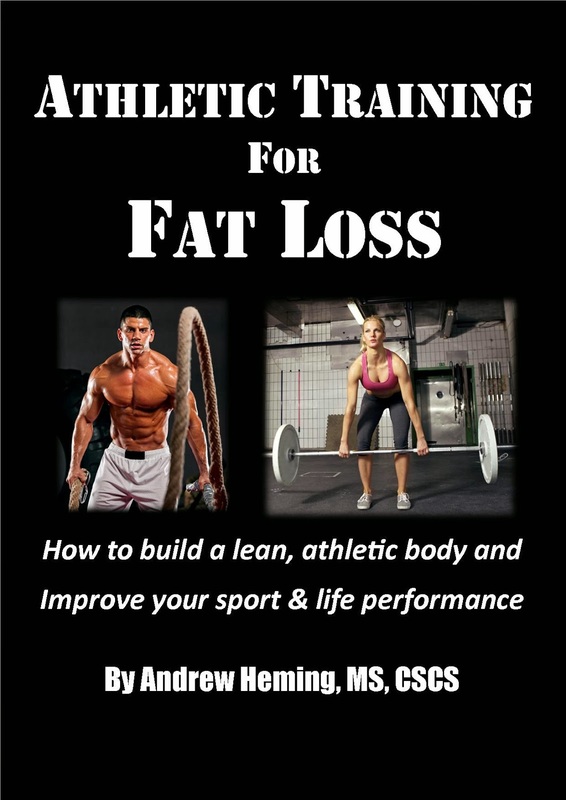 Note: if you need a training program to get you on track, check out my new book "Athletic Training for Fat Loss". 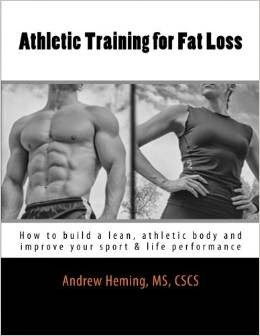 It contains 17 complete training programs ranging from beginner to advanced and it will help improve your sport/life performance and help you develop a hard, lean athletic body. Click HERE for more details. Most people have many other important obligations in life (e.g. family, work, sports, etc.) that require them to be very efficient with their training time. Time efficiency training start by picking the best exercises, programming efficiently and staying focused during your training sessions. For more information on time-efficient training, check out Time Efficient Training Part 1 and Part 2. It has often been said that "90% of success is showing up." All the other habits are meaningless unless you can consistently get yourself into the weight room. If you wait for free training time to magically appear during the day, you will be waiting a long time and be in very poor shape. Most of us are too busy to train. However, you can make it happen if you treat it like any other important appointment. Schedule it in and let nothing short of a true emergency keep you from keeping the appointment. Regardless of your training goals, seek performance improvement in the gym and get excited about PR's (personal records). If the barbell does not change, do not expect to see your body change or perform any better. Remember it is not doing the best exercises that makes you better. It is about getting better at the best exercises that makes the desirable changes happen. The only way you can do this accurately is to keep a detailed record of your training. This can be done with either an old-school notebook or a fancy new app for your new iphone - just be sure your training gets recorded as it is happening! Note: if you have body composition goals, consider keeping a food log. The secret to getting the results you want is to combine good, goal-specific training, nutrition and lifestyle habits at the same time. The magic is in the synergistic effect of addressing these areas simultaneously. They do not have to be perfect, but results are not just about what you do in the gym. Setting some basic, behavioral goals for your nutrition and lifestyle is a necessary ingredient for your success. Part of real training and being focused on the goal is regular assessments to ensure that you are on track. As mentioned previously, progress in your training journal is vitally important. If you are not able to make regular improvement in your training performance, something needs to change. In addition to this, you want to assess other important things that relate to your goal (e.g. weight, girth measures, vertical jump, speed, etc.). Do not be obsessive and measure on a daily basis, but also do not train for months without knowing if what you are doing is working. A few simple assessments every 2-3 weeks works well for many goals. Also, keep track of how your body is doing. If you are noticing that your joints are starting to hurt, consider making exercise substitutions as needed to prevent a bigger problem down the road. Bottom line: what you are doing needs to work for you and be helping you get towards your goal. If training was easy, everyone would be in great shape. Even with great training program and solid lifestyle/and nutrition habits training success will not come without good, old-fashion hard work. Be smart and do not hurt yourself, but be willing to work hard if you want results. Also recognize that the bigger the goal, the harder you will have to work. All the best with your training!